How to create a checkbox column, that if selected will create a strike-through across the entire row in Google Sheets? I have a Google Sheets. I want to set it up so that the first column is checkboxes, and if the checkbox is selected, the entire row gets a strike-through. In other words, if a1 = ☑, then strike-through all of Row A. How do I apply this to the entire sheet? with formatting of Strike-through and Done. Conditional formatting: If checkbox ticked in cell A1, change color/strikethrough of cells from B1-F1. Insert a checkbox from "Insert" tab to A1. Select the cells (B1-F1) that needs to be of different color/strikethrough when a checkbox in A1 is ticked/ selected. From tab above, "Format" > "Conditional formatting". "Formatting style" = Select whatever change you want to see in the cells if checkbox ticked. For any checkbox that I tick, it will now apply the formatting style to that given row only. You can also do a: "Text Contains: TRUE" or "Text Contains: FALSE" check here. Not the answer you're looking for? 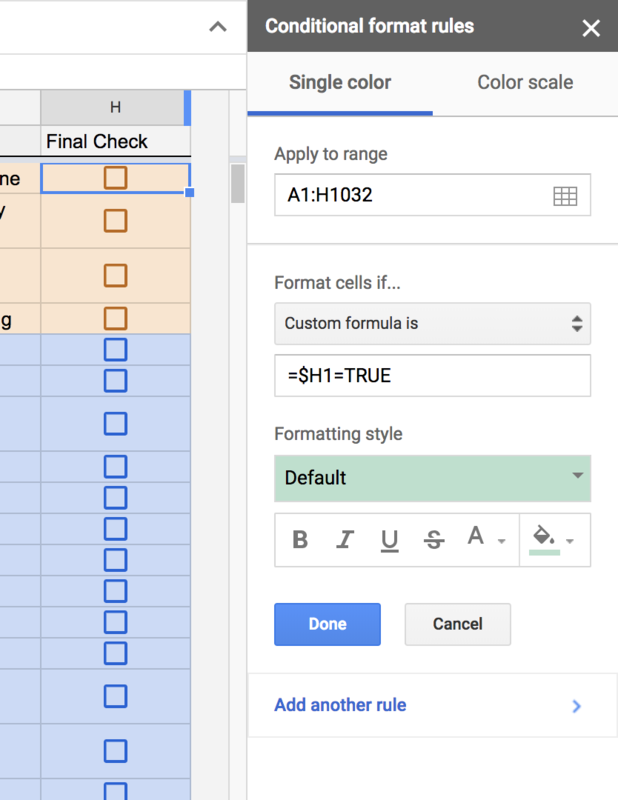 Browse other questions tagged google-sheets conditional-formatting formatting or ask your own question. Is it possible to add a checkbox/button equivalent?